War of words continues: Liberman says he joined opposition because Netanyahu 'abandoned' and no longer belongs to national camp. The public war of words between Prime Minister Binyamin Netanyahu and Yisrael Beytenu chairman Avigdor Liberman continued on Monday with an attack on the Prime Minister at the Yisrael Beytenu faction meeting. 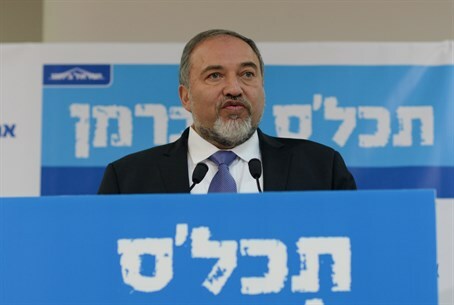 Specifically, Liberman addressed remarks made Sunday night by Netanyahu, in which the Prime Minister asserted Yisrael Beytenu voters would not have chosen party in March elections should they have known it would choose to sit in the opposition with leftists. According to Liberman, the Prime Minister "has forgotten the real reason Yisrael Beytenu is not in the current coalition and that is because Binyamin Netanyahu abandoned the national camp and no longer belongs to the Israeli right-wing." "For someone who refused to include the eradication of Hamas as a bottom line of the government, who refused to enact a law mandating the death penalty for terrorists, who does not dare to build Jewish neighborhoods in Jerusalem and the settlement blocs, who agrees to harm equality of the burden - he does not belong to the national camp." Liberman reminded his party that the Prime Minister supported the Knesset's plan for Disengagement from Gaza in 2005, and froze the transfer of funds to the Palestinian Authority only to approve their transfer after elections. "The same man who shouted on election day that Arab droves were flocking to polling stations in buses, and immediately after the elections apologized," Liberman added. "Therefore, Netanyahu is not Right or Left, but a zigzag master, the world champion of zigzagging," Liberman fired. "Yisrael Beytenu has no problem with Likud, but we have a big problem with Netanyahu. And not just us: go ask Benny Begin, Yuval Steinitz and Nir Barkat." According to Liberman, over 80% of Yisrael Beytenu voters agree with the party's decision to sit in the opposition. "Since the Prime Minister loves surveys, I suggest he check it out and see for himself." "Moreover," Liberman claimed, if the Prime Minister wants to do a wider, more in-depth survey, he'd find something else interesting: 80% of immigrants from the Soviet Union who voted in the last elections for Likud, would choose Yisrael Beytenu if elections were held today." "And I'm not pulling this out of thin air, but on the basis of surveys published on Russian websites operating in the country. So I suggest everyone, especially the Prime Minister, stick to the facts, and not make baseless claims."